What is it? Good question. Four stationary bikes, locked in on rollers next to each other. We connect them to a computer and projector. The bikes are allocated a different colour on a big ‘clock’ on the projector and race each other over 500m (about 30 seconds). It adds up to massive amounts of fun, hilarity and just a little inter-school rivalry! Check out the video below to watch highlights from last weekend's roller racing at our Corporate Pursuit to get an idea of what it is all about. 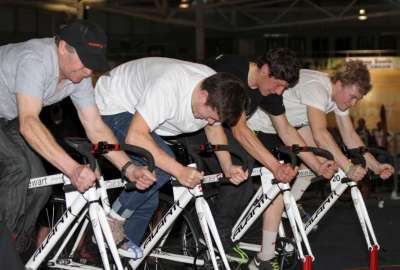 Our aim is to bring the Ultimate Ride Off Roller Racing Competition around Southland schools from next week and thought lunch breaks would be the best time to allow everyone to have a go (perhaps setting it up in the school gym or somewhere similar). We predict we will be able to get about 60 students through in about 45 minutes, (more if we are really speedy!) So I will leave it up to you to decide how you choose students who will take part. 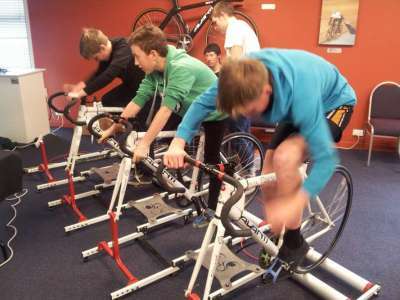 We have also booked the Sarah Ulmer Lounge at the Velodome on July 24th and 31st and August 7th and 14th, from 4-5pm to give those who are extra keen, or those who didn’t get a chance when we came to your school, the opportunity to have a go. Our idea is that the fastest two male and female students from Years 9-10 and 11-13 will earn themselves a free ticket to the last session of the Junior World Champs on Sunday August 26th to watch the competition and take part in the “ULTIMATE” Ultimate Ride Off competition against the top qualifiers from other secondary schools. We think it is a fantastic way to give students an opportunity to experience the awesomeness and enormity of the Junior World Champs and we are really excited to be able to present this opportunity to your school and students.